The farm has been a wonderful place to live and raise our daughters. From the start our philosophy has been to leave the land in better shape than we found it. When we started farming we saw two problems: erosion and 40 acres of Canada thistle. We decided to base our farming decisions on the long term benefit to the farm and not just short term consideration. For erosion control we decided to use ground covers between the tree rows to help hold the soil in place. As we learned more about our soils and farm, it was clear we had no extra soil to lose. The ground cover decision had consequences. The newly planted trees were stressed for water, so we began to irrigate the first couple of years trees were planted. The ground covers also gave a place for predator bugs to live, which helped keep the "bad" bugs to a minimum. Ground covers have cut the need for pesticides by 60 - 70% and help keep the mud off of trees at harvest, but require that we mow the rows each year. Our understanding of the farm has grown and grown, but it is much more complex than we thought when we started. Our decision to use ground covers has been interwoven into many other aspects of the farm. We are still learning and loving it. Currently Pat and Betty farm Christmas trees on about 70 acres and timber on 35 acres. They have live in their passive solar house which they built 30 years ago. Thanks to Betty's 6th grade social studies teacher, Mr. Pierce, and we knew that erosion was a bad thing for a farm. When we started, we just managed the grasses and weeds that already existed. Since this farm had been sheep pasture, much of the grass was tall fescue. It can grow to over 4' tall and it was crowding out the lower branches of our trees. Tall fescue is great for roadways. But we needed something different for the tree fields. We began a search for "designer grass". What we want is a low growing, easy to get rid of grass or cover that does not attract gophers or moles and does not spread too easily. We would like it to go dormant as soon as it is stressed for water and not have the seed stay viable in the ground for 20 years. If the grass only grew 6-8", we would love it, because then we wouldn't have to mow. 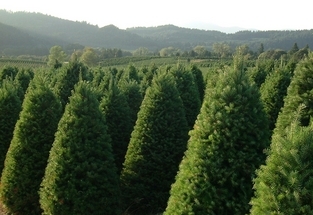 Most Christmas tree farms are managed with the idea of bare ground around the trees as best. When we started farming here there were 40 acres of thistle. We think this came about from the prior management team spraying out all the easy to kill things like grass, but allowing the harder to kill weeds like thistle to exist. Ground covers hold the soil while keeping the invasive weeds away. Ground is not naturally bare. Over the years our tolerance and appreciation for nature and its messiness have increased. Right now we mow once a year. We pay attention to when we start the mowing so that the ground nesters, such as the Western Meadowlark, are finished raising their babies. The ground cover decision led to many consequences both good and expensive. But it is right for us, our employees, our water and our farm. 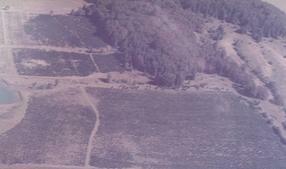 In this 1981 photo we can see where there is white space, trees have died or are not doing well due to too much water drownding the roots in the winter. Part of farming is having water when you need it and not to have too much when you don't need it. We learned that even the best intentions can sometimes give a bad result. Years ago we had help from a couple of Oregon State graduate students who were studying the effects of ground covers on the growth of trees. They put moisture blocks at the depths of 1', 2' and 3'. We all shared the work of taking readings for those blocks. It was a huge amount of data that told us the ground covers were taking water away from our baby trees. We decided to irrigate our new plantings and built a pond. The pond is a great place for blue herons, osprey, red-winged blackbirds and the occasional beaver. It also is an emergency supply of water in case of fire. When we built it, there wasn't a fire department out here. We irrigate once a year for approximately 1-2" of "rain". Once the trees are 3 or 4' tall their root system is established and they don't need to be irrigated. We learned early on that we needed to manage the water that is already here, too. One time we flew over the farm in a small plane. We discovered that it wasn't just the water on our farm that was important, but also the water and farming practices across fence lines both upstream and downstream that were important, too. The first thing the three rolls of pictures showed, was the high water table in some fields that was damaging or killing trees. We have now tiled most of our farm. As expensive as that was, it has paid off in better root development and far better quality trees and fewer trees dying or stressed due to a high water table in the winter. The next thing we did was to put in diversion ditches and piping to control the water coming into our farm from the neighbors. Where necessary, the ditches have rock structures to slow the water down and to allow the erosion coming from our neighbors to settle here. Fortunately, our neighbors downstream have managed their water so that it does not back up into our farm. The tall fescue that was a problem out in our tree fields is actually a help in our grass waterways and non-rocked wagon roads. It is tough, tough, tough. Our stream bank enhancement program took a great jump in 2007. We have fattened out the trees and brush along all our waterways. What once was pasture is now planted to ponderosa pine, Douglas-fir, western red cedar, grand fir and many deciduous shrubs. Pat getting ready to cultivate next to newly planted trees as part of our IPM system. Being a farmer means being a detective: Why is this tree growing so much better than the one next to it? What caused the damage to the tree needles? And on and on. We have three great tools to help us: a hand lens, pruners and OSU Extension Service. Integrated Pest Management (IPM) means assessing all possible answers to a problem and choosing the best one. It also means canvassing your farm to catch problems before they become large problems. We start by estimating possible economic damage and answering some questions. Will they outgrow the damage? If we do nothing will the damage spread? If we do something, how much will it cost? Immediate costs? Long term costs? And we try to follow our philosophy of walking with the lightest footstep. Our first choice to handle an insect problem is for a biological or mechanical answer such as to encourage birds or to pick off the insect such as the silver spotted tiger moth by hand. In new fields, it has been effective to just pull up an invasive weed such as maidenhair or small patches of wild oats. Here at the farm we have dozens of bird nests. We were part of an Environmental Protection Agency test to bring back bluebirds to this area. We have a dozen nesting boxes around the farm. We have added close to two dozen more bird houses on structures around the farm. We have 3 hawk roosts so they can help reduce rodent populations. We have had to adjust some of our farming practices for Douglas-fir and noble fir, because birds can cause damage to tree leaders. Our last choice for problem solving beyond biological or mechanical is chemical. And even then there are choices. If we have to choose a chemical, we choose the one most specific to the problem and apply it carefully. What is the minimum area we need to do? We have not found it necessary to spray by helicopter or airplane. A backpack sprayer puts the chemical exactly where you want it. We also choose the least toxic, least movable and least long lasting chemical. Chemicals are a tool and should be used sparingly and wisely. Sometimes soap is as effective as commonly used sprays. It helps that Pat has done a lot of research on what species and seed source work best for our farm. Right now we are part of a Nordmann fir test at 5 or 6 different farms to see what see seed sources are best. What we have learned is being the part of a test tells us what grows best right here and that is important knowledge. We have been looking for an alternative to using chemical fertilizers. Our latest test is using compost tea either applied to the soil or to the foliage. In early November, 2009, we applied compost tea to 180 trees. We are testing grand fir, Nordmann fir and Douglas-fir. The trees are 2-3' tall. In May, 2010, we reapplied the compost tea to the soil and foliage. We expanded the test to include some larger trees of all three species. After the trees finish growing in 2010 we will make an assessment. We will continue this test for at least 3 more years. According to www.buycomposttea.com, compost tea is a liquid solution rich in nutrients and microorganisms, such as bacteria, fungi and protozoa that is created by brewing or steeping mature compost in water.